Since 1988, Surveyors and Contractors have counted on Superior Instrument to provide the best products and service in the industry. In 2008, we marked a milestone in our history with the completion of our Superior GPS Network Foundation! 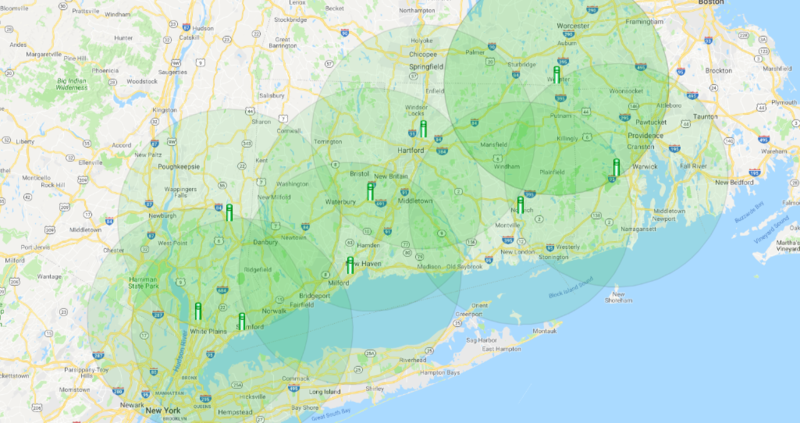 Superior Instrument is leading the industry by building the foundation of Connecticut's first and only full functioning and growing GPS RTN Network. We have invested in this technology so our customers can benefit from it. Join us as we change the face of surveying and construction positioning in Connecticut. With the Superior GPS Network, our customers can take advantage of lower equipment pricing, greater flexibility and ease of use. It all adds up to helping our customers improve their business by being more efficient. Our GIS and mapping customers will benefit from tighter point position grouping, improved accuracy and better DGPS coverage. This means less down time even in marginal conditions. That adds up to better quality work and faster feature collection! Many current models of sub-meter DGPS receivers can access the Superior GPS Network and take advantage of this state of the art technology. Call Us Today More Information! NAD83 (1996) datum is referenced for base station locations. Access to the SUPERIOR NETWORK is controlled using NTRIP protocol or by registering a static IP. We have tested the system using using GSM or CDMA communication (Cingular & Verizon). Multiple system access discounts are available, call for details. Signed agreement required prior to access. Technical support to assist in connecting billed per hour.